Ring holders and ring cones are two of the most stylish ways to showcase and store your favorite rings. They’re also incredibly easy to create, with a variety of DIY tutorials already available to help you out! Today we’ve rounded-up 35 of these wonderful tutorials and they will teach you how to make the ring holder of your dreams. From cacti, to animal figurines, cement cones, skeleton hands and everything in between, there’s sure to be a DIY project here for just about everyone. You’d be forgiven for thinking that these DIY hand ring holders were picked up at a high-end boutique, but Alisa Burke actually created these herself – Wow! The good news is that you too can make some for yourself, so be sure to check out her tutorial. If you haven’t noticed the DIY trend that is ring cones by now, then you’ll want to take note! Almost Makes Perfect has created these eye-catching DIY black and white versions. We love these very different versions of ring holders from Atilio, featuring both your more traditional ring cone and a quirky cactus shaped holder! Which design will you choose to make? Here are some more pretty DIY ring cones, this time from the talented bunch at Brit + Co. We love the assortment of eye-catching patterns and colors, don’t you? These fun little ring cones contain colorful and vibrant patterns, showing you that anything is possible really when it comes to decorating your DIY masterpieces! Don’t miss this wonderful tutorial from Brit + Co.
C By Clemence has used a speckling technique and plenty of gold foil to create these stunning ring holders. They might look tricky, but thanks to this step-by-step guide you too can create these in no time! Cherry and Mint created one DIY ring holder for herself, only to create a second, fun version to accompany the other! Craft is certainly addictive. Find out her secrets to creating these projects by checking out her tutorial. This DIY octopus ring holder looks amazing! Craft Sew Love Grow created this using clay, and we know you’re going to love her easy process. Now here’s a unique idea for ring holders! Crafty Chica has created hers using old nail polish bottles – clever! These DIY ring cones from Cupcakes and Cashmere have a wooden appearance and contain soft, pastel shades of paint to add an eye-catching look. You could even give these as gifts to loved ones! Creating your own clay ring holder hand could not be easier, thanks to this tutorial from Divine Caroline! You use a glove to achieve that realistic shape. If you love the simplicity of grey clay, then you’ll love these DIY ring holders from DIY in PDX. You can also paint these or decorate them in any way you see fit, so this tutorial serves as a great all-rounder. You can also create a simple little dish around your ring cone to sit other pieces of jewelry in, such as bracelets, necklaces or earrings. We love this idea from Dwell Beautiful. Here’s another great DIY idea from Dwell Beautiful, this time featuring a way to hang your rings from a beautiful piece of wood. What a work of art! This gorgeous DIY idea from Enthralling Gumption might be aimed towards storing earrings, but as it’s the same concept as the ring holders, you can still use it to store those too! We just can’t get enough of this fun and colorful pattern. Here’s a simple yet stunning ring holder and dish project from Everyday Dishes that we know you’re going to love! Creating your own jewelry display piece has never been easier. Marble is very on-trend right now and Homemade Banana has created her very own marble and gold-adorned ring cones – Brilliant! Check out her full instructions to make your own too. Here’s a clever idea for a ring holder that you can make within just one hour (or less – seriously!). Home Talk will show you how it’s done. Who couldn’t love this adorable DIY cactus ring holder? Kin Community will show you how to make your own via a video tutorial on their Facebook page. Speaking of everybody’s favorite succulent, Lindsey Crafter has actually created two gorgeous ring cones with one featuring cacti painted on it. The other one has a lovely fern leaf design and we simply can’t choose which one we love more! Isn’t this heart-shaped ring holder and dish from Lovely Indeed quite beautiful? We love the gold gilded edges too! Here’s another unique ring holder design, this time from Merriment Design. Mix and match the color for a look that’s totally unique! You’d certainly pay a small fortune for this beauty if you stumbled upon it in somewhere like Anthropologie, so why not make him yourself? This tutorial from Michaels will show you everything you need to know. Infuse your room with some Halloween inspired décor, just as Mr Kate has done! This tutorial will show you how to easily turn a skeleton hand into a gold, ring-holding version. Here are some more stunning animal inspired ring holders! My Crafts has created versions featuring both an elephant and an owl. A faux antler is just the perfect shape to hold all of your favorite rings! One Broad’s Journey will show you how it’s done. These fun DIY ring cones have a festive look about them, would you agree? Poetit has made them in a variety of heights and patterns, so we have a feeling you’ll want to check out the full tutorial! This little guy is going to be a huge DIY hit! Revamperate has created a cactus ring holder that we think is too cute for words. If working with clay isn’t exactly your thing, then you’ll be pleased to hear that Small Good Things has created DIY ring holders from plastic cat figurines! Simply paint them in any color of your choice and hang your rings over their tails. We love the combination of faux granite and gold! Stitches and Press gained inspiration from this pattern and color when it came to making her own DIY ring cones. Here’s another fantastic DIY ring holder idea, also using a plastic figurine for ultimate cool-factor. The Band Wife painted a dinosaur figurine in gold and used its long neck to store her rings. 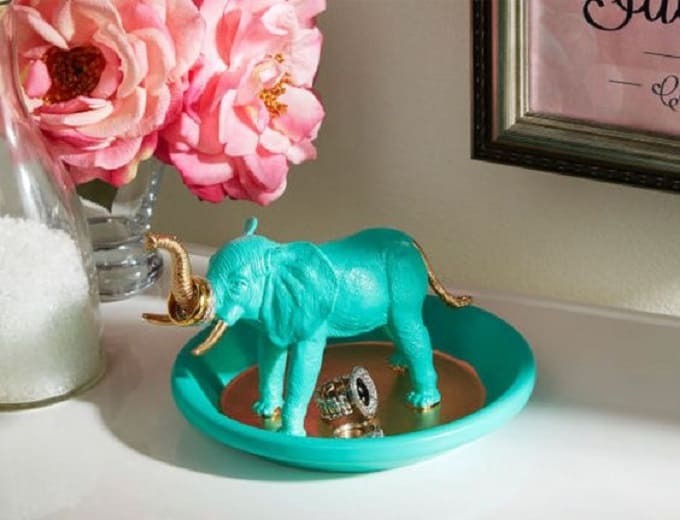 Perhaps one of our most favorite DIY ring holders so far, this version from The Crafted Life has pops of color everywhere you look! The cone is perfect for storing your rings, while the dish is great for storing other bits and bobs of jewelry. 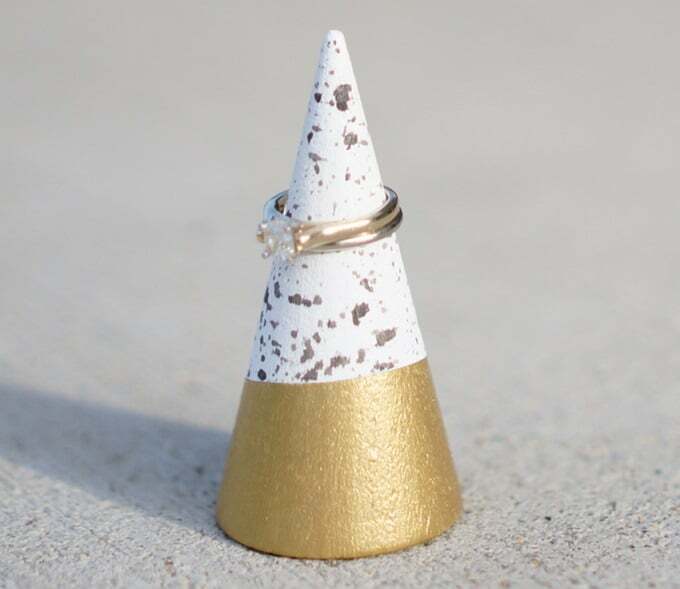 This DIY ring cone from The Crafted Life takes just 5 minutes to make – Wow! You can buy the cones already made on Etsy and then decorate them until your heart is content. Affordable and fun! We’re loving this DIY Eiffel Tower ring holder version too! You can find the full tutorial as a guest post via This Little Street. Here’s some more cool cacti that serve as the perfect ring holders. Vitamini Handmade has created hers in a versatile color palette of white and gold. There you have it – 35 DIY ring holders that are fun and simple to create! Which ones were your favorites? We’d love to hear from you in the comments section below! I’m honored to be featured among so many great options!